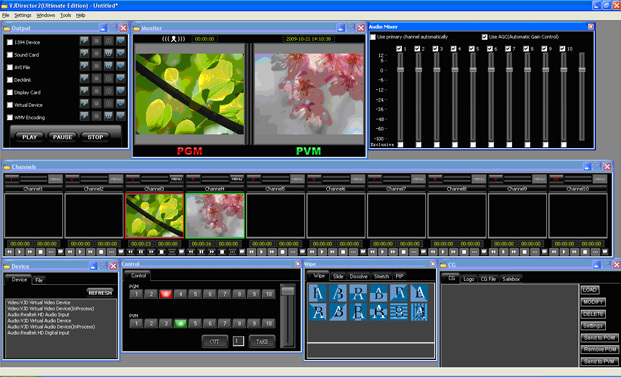 VJDirector2 (Live production software) is a software includes special effect switching unit, CG editor, VGA capture via network, vitual cam, chroma key, subtitler, video recorders, network broadcasting system, auto broadcasting system and linear editing system. PS: VJDirector2 has 3 different editions(Streaming, Standard, Ultimate). Features vary with different editions, refer to http://nagashare.com/vjdirector/compare.html. software for HD multimedia editing, recording and broadcasting. Supporting many switching effects between any input channels. Supporting 1-4 logos, which can be set to any of the four corners. Logos support single files and TGA file sequence. Supporting auto and manual subtitles. The font can be customized, supporting numerous font effects: 3D, shadow, frame etc. You can publish CG elements include text, picture, picture sequence, clock and timer on the video. Supporting publish CGs by a remote computer. And the periods, speed, region of the effects can be customized. Supporting chroma key and color adjustment on each channel. You can input a sequence of channels or files, also you can set the broadcast time of each channel or file. Qweas is providing links to VJDirector2 Ultimate Edition 2.0.928.0 as a courtesy, and makes no representations regarding VJDirector2 Ultimate Edition or any other applications or any information related thereto. Any questions, complaints or claims regarding this application VJDirector2 Ultimate Edition 2.0.928.0 must be directed to the appropriate software vendor. You may click the publisher link of VJDirector2 Ultimate Edition on the top of this page to get more details about the vendor.